If you’ve spent much time tinkering with electronics, you’ve probably heard of [Seeedstudio] from their development boards, tools, and their PCB fabrication service. Their latest Kickstarter venture is the RePhone, an open source and modular cell phone that will allow hackers to put together a phone by blending GSM modules, batteries, screens, and other stock units, including an Arduino-based processing core, GPS, NFC, and other building blocks. The funding campaign has already exceeded its goal and delivery is scheduled for next year with a basic kit weighing in at a projected $59, according to [Seeed]. Presumably, the core phone module will have regulatory acceptance, but the other ancillary modules won’t require as rigorous testing and certification. What would you do with an inexpensive, embeddable cell phone? The modules are tiny, so you could implant them in lots of places. Some of [Seeed’s] more interesting ideas include building a phone into a walking stick, a dog collar, or a kite (although we were thinking quadcopters). Of course, we’ve seen GSM and cell phone shields for Arduino before. Difficult to imagine sticking those in a dog collar, though, unless you have a fairly large dog. If you are a fan of 1960’s TV, it is easy to imagine a better shoe phone or a working Star Trek communicator. Seeed Studios has launched a contest centered around the DSO Quad. In case you’re unfamiliar with the hardware, the DSO Quad is a low-cost standalone oscilloscope. It’s got four channels, two of which are analog, and includes an ARM Cortex-M3 processor as well as an FPGA. Why are we recapping the hardware with the contest announcement? Because the contest rules state that you are allowed to alter the hardware despite the fact that this is more of a software-focused event. But what you really should know about are the cash prizes going to the winners. Rank in the top four and you’ll claim $3000, $1500, $800, and $300 in cold hard cash. But even if you don’t take one of the top spots everyone still wins. That’s because all entries are open source and will be found in Seeed’s DSO Quad forums. If judging people is more your thing Seeed needs some help with that too. They’re looking for qualified judges and application details are includes at the bottom of the contest page. 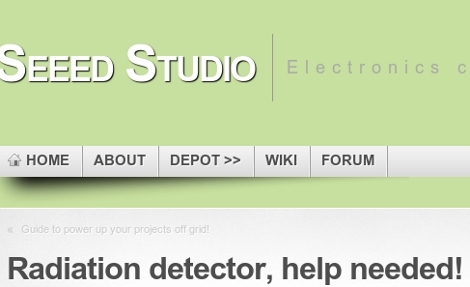 Seeed Studios, makers of the Seeeduino and fabricators of small-run PCB orders have put out a call to help develop an open source radiation detector. Will it be of any help to people in the area of Japan that is at risk? We really can’t say. But if you can lend some expertise with this, it can’t hurt. We’ve already seen a simple dosimeter project but this one sounds like it’s more on the level of a DIY Geiger counter. We know it’s possible, but the hacked together unit we saw back in 2007 had very little documentation and used parts that may be hard to come by. The specific information needed is what type of sensor to use, what supporting circuits should be included, and what method is best to calibrate each unit. There’s a discussion going in the comment thread of that post which should be interesting to read even if you think you don’t have anything to add. Seeed Studios has a new version of the Arduino that they’re calling the Seeeduino Film. Instead of the traditional fiberglass substrate they’ve used a resin material to produce a Flexible Printed Circuit (FPC). In addition to its flexibility their aim with this prototype was to keep it modular. From what we can see each of the four squares is a different component in the Arduino system. The photo above has the USB interface on the nearest node, then the power regulator, the microprocessor, and finally the remaining peripheral connections. This material can easily be cut with a pair of scissors so the programming section can be removed once the firmware is burned to the chip. It will be interesting to see final pricing and package options. We wouldn’t mind having an FPC ATmega168 breakout board around, but specifially this would fit nicely in a watch band if you were building your own wristwatch.